Following six months of turmoil since the ouster of founder Shai Agassi, Better Place is shutting down all operations and seeking an orderly liquidation of the company. 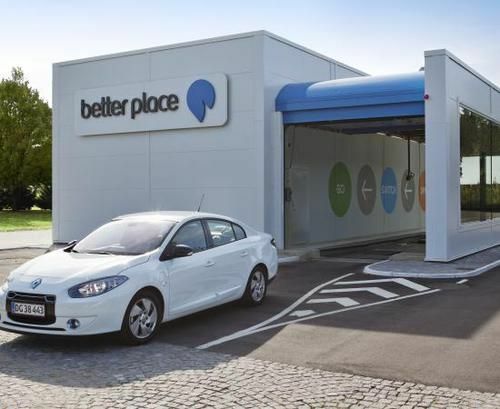 After reports late last week that Better Place was about to file for bankruptcy, the company announced on Sunday (Israel time) it filed a motion with the Lod District Court, in Israel, to ask for the dissolution of the company and the appointment of a temporary liquidator. This move for complete liquidation ends a compelling, but in the end unworkable, vision for electric cars deployment. Renault, the car manufacturer partner of Better Place, issued a statement reaffirming the commitment of the Renault-Nissan Alliance to electric cars. The vision behind Better Place was created by former SAP executive Shai Agassi, and centered around offering services to foster the adoption of electric cars. The core technology is a fast, roboticized, battery swapping system. A driver pilots their electric car into a facility somewhat similar to an oil changing station, robotic equipment lowers the battery pack into an underground chamber, and quickly replaces it with a fully charged pack. The process takes a minute or so and would enable road trips with electric cars, if these stations are widely enough installed. However, the battery swapping stations are expensive to build, and there was little actual adoption of electric cars compatible with that system. Better Place says that over the last six months, management has made "fundamental changes in the company, focused its strategy, goals and markets and at the same time has continued to seek additional financing for the business and secure additional models to supplement its current offer." Some of those changes include the ouster of founder Shai Agassi, layoffs, the new CEO being ordered to come up with a new business plan, the subsequent ouster of the new CEO, more layoffs, and the shutdown of all operations outside Israel and Denmark. The core problem is anemic sales of electric cars compatible with the Better Place battery system. Better Place is not a vehicle manufacturer. Instead their business is operating electric car charging infrastructure. The company relied on getting car manufacturers on-board with building electric cars whose battery packs could be switched by the Better Place system. Renault was the only company to do so. The recent efforts to refocus the company, and slash operational costs, was not enough. The Board has decided that it has no option but to seek to make this application to the Courts for an orderly liquidation of the company. Better Place Chief Executive Officer, Dan Cohen, said: “This is a difficult day for all of us. We have come a long way in order to bring about a global vision. From the start, Better Place was a breakthrough for the infrastructure of the electric car industry and successfully completed the development of its technology and infrastructure. Israel was the first place in which an electrical car could travel without limit. On Monday, Renault issued a statement saying: "Renault acknowledges the decision of Better Place’s Board of Directors. The Renault network in Israel and in Denmark will continue to provide after-sales servicing for Fluence Z.E. and these vehicles’ batteries. Electric vehicles are a revolution in mobility. Renault is exploring all the charging technologies from quick drop to several alternatives. This decision does not at all call into question the electric vehicle strategy of the Renault-Nissan Alliance. The Alliance is the world leader in terms of electric vehicles, and the volumes of Renault’s EVs continue to progress month after month." In the Better Place model, the car owner does not own the battery pack but is leasing it from Better Place. In an interview with Israeli newspaper Globes, Cohen suggested the first issue the liquidator will have to face is the disposition of those battery packs. A possible risk is that the liquidator will repossess all leased battery packs, leaving car owners with a useless car. But the Globes article suggests an arrangement might be worked out with Renault.